Cabinets are perfect for storing tools, cleaning supplies, sports equipment, or any other commonly used items that you wish to keep handy. 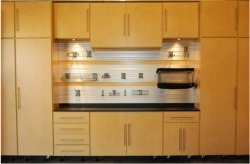 Our cabinets are wall mounted allowing for easy cleaning, and maneuvering around them. We install wall mount garage cabinets in the following cities Venice, Parrish, Plant City, Lakeland, Zephyrhills, The Villages, Ruskin, Apollo Beach, Wimauma Spring Hill, New Port Richey, Port Richey, Land O Lakes, Wesley Chapel, Odessa, Sun City, Bradenton, Sarasota and Brandon.